> Until 10 years ago, hardly anyone had heard of methane hydrates. But now these chemical compounds in the sea floor are mooted to be an energy source of the future. The amount of hydrate-bound u far exceeds the reserves in conventional deposits. However, methane hydrates are not only a potential energy source; they also pose a considerable climate risk. Methane hydrates are white, ice-like solids that consist of methane and water. The methane molecules are enclosed in microscopic cages composed of water molecules. Methane gas is primarily formed by microorganisms that live in the deep sediment layers and slowly convert organic substances to methane. These organic materials are the remains of plankton that lived in the ocean long ago, sank to the ocean floor, and were finally incorporated into the sediments. Methane hydrates are only stable under pressures in excess of 35 bar and at low temperatures. The sea floor is thus an ideal location for their formation: the bottom waters of the oceans and the deep seabed are almost uniformly cold, with temperatures from 0 to 4 degrees Celsius. In addition, below a water depth of about 350 metres, the pressure is sufficient to stabilize the hydrates. But with increasing depth into the thick sediment layers on the sea floor the temperatures begin to rise again because of the proximity to the Earth’s interior. 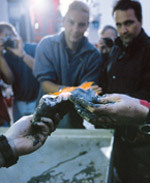 In sediment depths greater than about 1 kilometre the temperatures rise to over 30 degrees Celsius, so that no methane hydrates can be deposited. This, however, is where the methane formation is especially vigorous. First, small methane gas bubbles are produced deep within the sediment. These then rise and are transformed to methane hydrates in the cooler pore waters near the sea floor. So the methane is formed in the deep warm sediment horizons and is converted and consolidated as methane hydrate in the cold upper sediment layers. 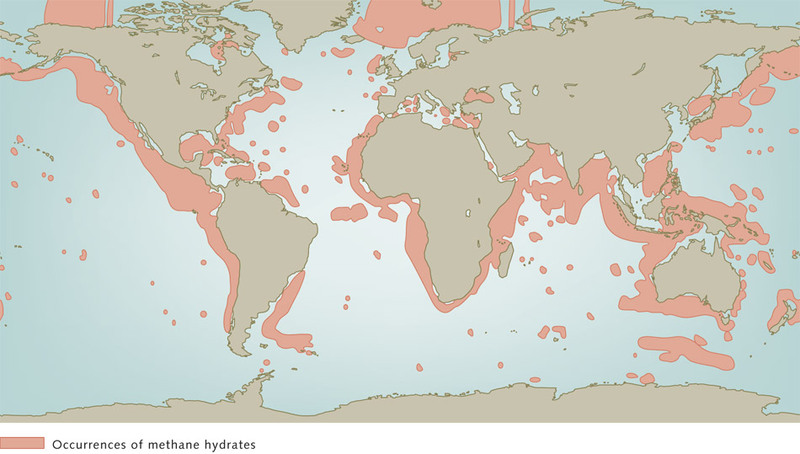 No methane hydrates are found in marginal seas and shelf areas because the pressure at the sea floor is not sufficient to stabilize the hydrates. At the bottom of the expansive ocean basins, on the other hand, where the pressure is great enough, scarcely any hydrates are found because there is insufficient organic matter embedded in the deep-sea sediments. The reason for this is that in the open sea the water is comparatively nutrient poor, so that little biomass is produced to sink to the sea floor. Methane hydrates therefore occur mainly near the continental margins at water depths between 350 and 5000 metres. For one reason, enough organic material is deposited in the sediments there, and for another, the temperature and pressure conditions are favourable for methane to be converted to methane hydrates. Vast amounts of methane hydrate are buried in sediment deposits on the continental slopes. The total global amount of methane carbon bound up in these hydrate deposits is in the order of 1000 to 5000 gigatonnes – i.e. about 100 to 500 times more carbon than is released annually into the atmosphere by the burning of fossil fuels (coal, oil and gas). At low temperatures the methane hydrates on the sea floor are stable, but if the water and the sea floor become warmer, then the hydrates can break down. Because microorganisms then oxidize the resulting methane gas to form the greenhouse gas carbon dioxide (CO2), methane hydrates have recently become a topic of intense discussion within the context of climate change. Methane, which itself acts as a strong greenhouse gas, does not escape directly out of the sea as methane because it is transformed into CO2. But the formation and release of carbon dioxide are considerable. 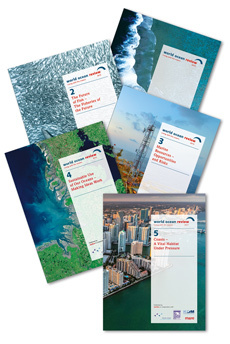 An additional problem is that the oxygen in seawater is consumed through the formation of carbon dioxide (Chapter 2). 7.7 > It is known that methane hydrates are present throughout the world’s oceans, primarily on the continental margins. Estimates of the total amounts of the deposits, however, are still very inexact. In 2008 British and German researchers discovered gas seeps at a depth of 350 metres on the continental slope off Spitsbergen that are probably fed by melting hydrates. Long-term measurements of the water temperatures off Spitsbergen indicate that the bottom-water masses and thus also the slope sediments have significantly warmed in recent decades. Models also predict that the sea floor in Arctic areas will continue to heat up in the coming decades and centuries due to climate change. Scientists therefore fear that large quantities of methane hydrate will melt there in the future, releasing increased amounts of CO2 into the ocean and the atmosphere. The oxygen content of the seawater will decrease accordingly.